Lake Sonoma is about 11 miles from one end to the other. The Thumb campground is on the secluded, narrow Dry Creek Arm of the lake. There are numerous coves to explore just in the 5 MPH zone. Swimming is allow. Early mornings are usually super calm, and is a good time for some smooth water kayaking. In the Looking For box, enter "Boat Site". In the Park or Facility Name box, enter "Lake Sonoma". Select the Specific Date bullet. Enter a date for the Arrival Date. Enter your Length Of Stay; for weekends there is a 2 night minimum. Click the Search button. 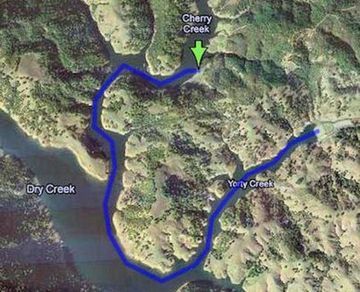 On the results page, click "Boat-In Sites (Lake Sonoma) (CA)". On the next results page, click the Date Range Availability link. It's going to say "no results found. ", but it will display correctly if you do the following. Now, click on the "(Clear search and show all)" link. For the Loop box, select "THUM". Click the Search Site button and you will see all 10 camp sites of the Thumb campground. Just remember that it takes about an hour to paddle the 3 mile distance to the campground. Cell phone coverage is low or non-existent at the campground. Campground check-out is 12 PM. The time that I realized that I need a dry bag was when my son and I kayaked down Stanislaus River. Usually we like to kayak rivers in 100 degree weather, so we don't even think of needing a dry bag, or any extra clothing. However, this day was around 80 degrees and my son got a bit cold while we were on the river. He eventually warmed up basking in the sun, but it made me I realize that I need extra clothing and towel that are not wet from all the splashing. Below is the dry bag I ended up buying. It's not too expensive; is just the right size for one or two people (perfect for my tandem inflatable kayak). This Attwood large dry bag is very sturdily made and the blue see-through plastic makes finding things inside easy. I've put many nautical miles on it since I got it last summer. To me, kayaking is about exercise and exploration. More about exercise later, but if I was to explore any place more than a couple of hours drive, I'd like to stay overnight. I have found camping to be an excellent way to do that. Just drive up the night before, camp, then wake up and kayak. It's a little more involved than that logistically, but that's the general idea. Usually, campgrounds are located closer to kayak destinations than any hotel. Another way to plan a trip is to seek out great campgrounds and just bring the kayak. 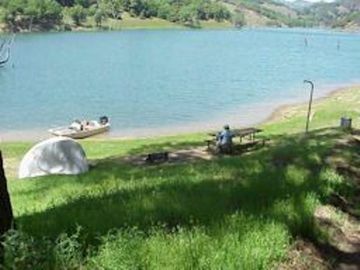 Often times the best campgrounds are near a lake or river.